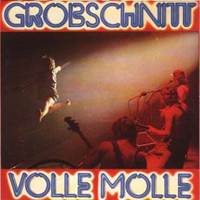 This album is probably the most representative of the Grobschnitt's career. It's simply a small part of everything they done between the latest 60's till the end of the 70's. It starts with the best Grobschnitt's ballad 'Snowflakes' and closes with the extraordinary Rockpommel's Land. The last song is not the same of the studio album, but a mix between the first song and the end - guitar solo - of the last song also called Rockpommel's Land. In the middle we have good songs, the band presentation and the comedy (joke) song Coke-Train-Show. It's a good live album, but isn't Solar Music Live. For a band with several five stars albums this live record has some disappointment moments, but it deserves three stars.